Shaheed Bhai Amarjeet Singh ‘Shahzada’ was born in the house of Sardar Inder Singh of village Dhirovaal, district Jalandhar. 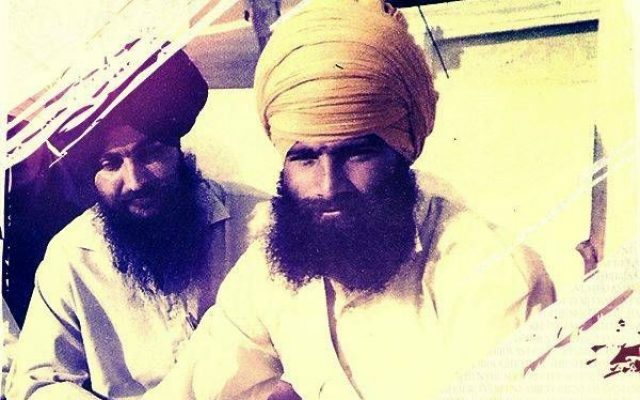 Under the leadership of Jathedar Sukhdev Singh Babbar and Bhai Vadhava Singh, Bhai Amarjeet Singh gave his priceless contribution to the Sikh Freedom Movement. Bhai Vadhava Singh, impressed by Bhai Amarjeet Singh’s physical stature, manner of speaking and personality nicknamed him Shahzada or ‘Prince’. He was 22 or 23 years old and he was quite tall with a strong body and glowing face. He was always smiling and ready to laugh. Whoever sat with him even for a short time began to feel as though they had known him for ages. He did not care about the comforts of home. The attachment to his family did not ever drag him back. The events of June 1984 moved him so profoundly that one day he left home saying he was going to the store, but neither did he end up at the store nor did he ever return home. After many attempts, he was able to come into contact with Singhs of Babbar Khalsa. He presented himself for the service of the Panth and he was assigned to Bhai Vadhava Singh. Until his final days he served under his leadership. No one has any doubts about the discipline of the Singhs that served in Babbar Khalsa. No one could refuse the Jathedar’s orders. Bhai Amarjeet Singh too always remained in total discipline. Bhai Amarjeet Singh was very firm in Khalsa Rehit. He had memorized countless banis. He would begin his nitnem at 3 AM at Amrit vela and continue until 8 in the morning. Bhai Amarjeet Singh used to say to Bhai Vadhava Singh, “Bhai Sahib, I don’t want anything else but whenever I go out on a mission, I need a good-looking kurta pyjama because when I leave my body and people come to see my corpse lying in the fields, the youth should see the glow on my face and my smart clothes. Then they too will feel inspired and their hearts will themselves be pulled to join the Singhs. Satguru Sachay Patshah fulfilled Bhai Shazada’s desire to leave his body in a glorious manner on January 28, 1989 and made him an inspiration to countless others.